Have you ever wondered how Japanese women take care of their skin and put on their makeup? They have amazing skin and their makeup is always flawless. Now, wonder no more. 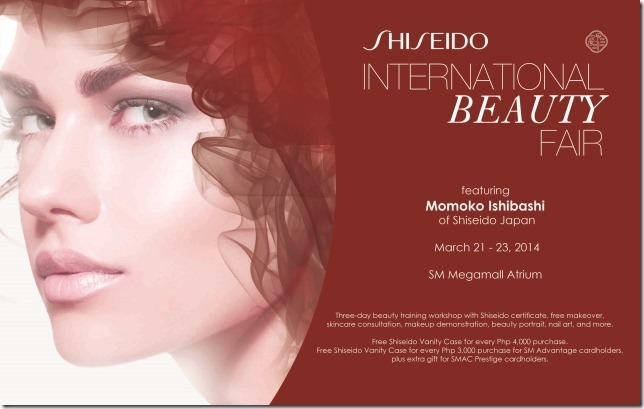 To welcome the Sakura season, Shiseido Philippines will be showcasing an International Beauty Fair on March 21-23, 2014 at the SM Megamall Atrium. There will be a three-day beauty workshop that will be conducted by Momoko Ishibashi of Shiseido Japan, along with Shiseido Philippines Chief Makeup Artist, Carmel Villongco. The coveted Shiseido Certificate will be awarded to the attendees upon completion of the 3-day workshop. If interested, RSVP via the Shiseido Philippines Facebook page and get a special loot bag at the end of the workshop. During the 3-day beauty fair, there will also be free skincare consultations, makeover counters, makeup demos, photo booths, Shiseido Cafe, nail art services and a glitter tattoo station. You can also get exclusive gifts and treats with your purchases during the weekend fair. OMG, I wish I've booked my flight going home a lot earlier so I'd be able to attend this. But I am keeping my fingers crossed that I'd be able to witness the opening of Shiseido Philippines' flagship store this April at the Mega Fashion Hall! Geesh, the Megamall is one place I won't dare miss to visit in my upcoming vacation. A lot have definitely changed since the last time I was there. To know more about Shiseido products and promotions, follow them on their Facebook, Instagram and Twitter accounts.